The numerous US military actions of the twentieth century have spanned the globe and led to innumerable consequences, but one truth is undeniable: without our military heroes, all would be lost. Yet even after these soldiers finally return home, many face incredible—and insurmountable—challenges. 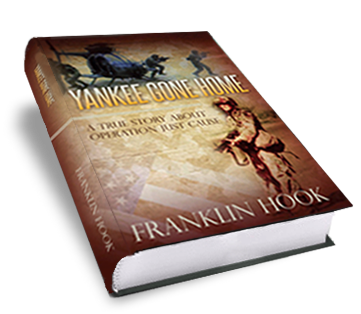 From noted historical non-fiction writer Franklin Hook comes this compelling true tale of one particular invasion and one particular man. This study is based on interviews, firsthand documentation, court-martial testimonies, and newspaper articles—but the story it tells goes beyond dry facts to reveal a profound human tragedy. Since returning home, Beard has been denied care for his PTSD because of that label. And there are more like him, struggling veterans who can’t get the help they need. These soldiers have taken the fall in a less-than- perfect system of military justice. This is their story. Among the memorable, unique, and disturbing sounds of the prison were the “phantom” typewriters that hummed continually, night and day, particularly during the height of Noriega’s purges of his political opponents and other enemies. Noriega’s madmen documented the entry of each prisoner in their infernal sanctum. Noriega’s secret organizations of extortion and mayhem, outside the prison, did not bother with such fastidiousness. Barabbas was a mystery to Muse and he showed much interest in the Barabbas story. The man was responsible for [the] howling that permeated the prison at night and invaded the souls of the inmates until it became part of them. Did a Barabbas figure indeed haunt the bowels of the prison, eating his [own] excrement, rattling his chains, and howling? Meanwhile, the sound was as diabolical as it was inexplicable to the uninitiated. I lengthened my stays within the prison, using every imaginable subterfuge to support the suffering hostage, and I completed the intelligence requirement at each visit. Then, there came a day when I played my first prank on Kurt Muse. The time was right, as there was a need for a new mood within the walls that encompassed us. Gradually the amused stare became a glare and a very angry one for an instant, and then Kurt began to laugh outrageously. He would repay the doctor in kind later, during a future visit. And despite the danger and diabolism, or maybe even because of them, our souls became wedded in the quest for sanity and survival. The day would come when I would see Kurt Muse safe; when I would behold Barabbas, for myself, in an extraordinary moment; and when I would again demonstrate some modicum of adroit and practiced wisdom that helps make life so much fun. History records that Kurt Muse was rescued, not without drama, in a well-planned and well-executed mission, by the US Army’s Delta Force, during part one of the Invasion of Panama. I was glad that I had helped the rescuers prepare for and plan that caper. James Ruffer’s modest account above pales in comparison with what one of the commanders on the ground, Col. Michael A. McConnell of the US Army, saw as Ruffer’s truly heroic actions; McConnell forwarded the account to higher headquarters with a recommendation for a Bronze Star with valor. Appendix A: Why Are They Called Snipes?